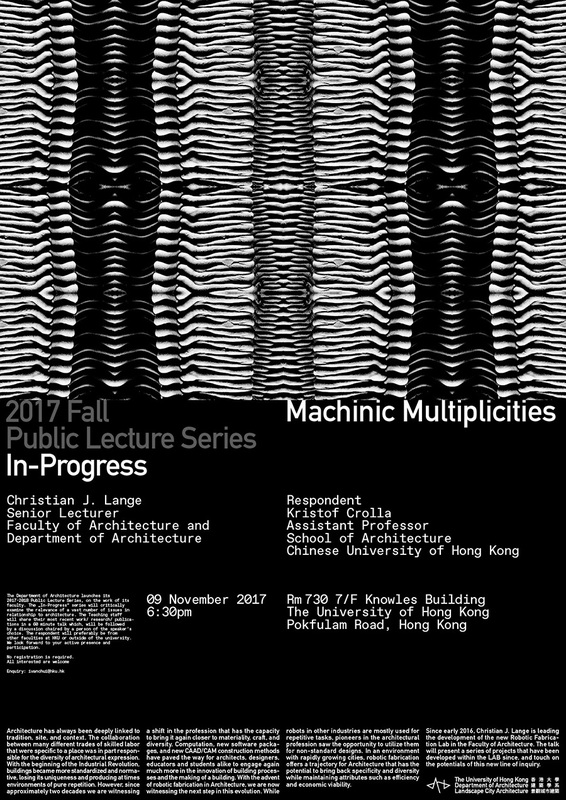 Christian J. Lange will give a talk entitled “Machinic Multiplicities” on November 9th 2017 at HKU. The talk is part of the current public lecture series entitled “In Progress” in the Department of Architecture. Architecture has always been deeply linked to tradition, site, and context. The collaboration between many different trades of skilled labor that were specific to a place was in part responsible for the diversity of architectural expression. With the beginning of the Industrial Revolution, buildings became more standardized and normative, losing its uniqueness and producing at times environments of pure repetition. However, since approximately two decades we are witnessing a shift in the profession that has the capacity to bring it again closer to materiality, craft, and diversity. Computation, new software packages, and new CAAD/CAM construction methods have paved the way for architects, designers, educators and students alike to engage again much more in the innovation of building processes and the making of a building. With the advent of robotic fabrication in Architecture, we are now witnessing the next step in this evolution. While robots in other industries are mostly used for repetitive tasks, pioneers in the architectural profession saw the opportunity to utilize them for non-standard designs. In an environment with rapidly growing cities, robotic fabrication offers a trajectory for Architecture that has the potential to bring back specificity and diversity while maintaining attributes such as efficiency and economic viability. Since early 2016, Christian J. Lange is leading the development of the new Robotic Fabrication Lab in the Faculty of Architecture. The talk will present a series of projects that have been developed within the LAB since, and touch on the potentials of this new line of inquiry. This entry was posted on Monday, November 6th, 2017 at 12:28 am and is filed under events. You can follow any responses to this entry through the RSS 2.0 feed. Both comments and pings are currently closed.